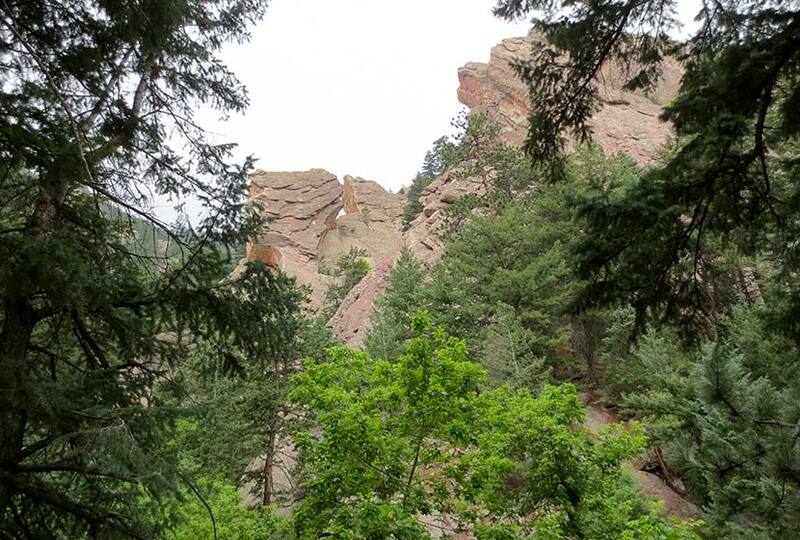 The hike up to Royal Arch in Boulder’s Chautauqua Park is a serious workout, but the beauty of Bluebell canyon and the view of Royal Arch make it worth the journey. Our most important tip for making this an enjoyable hike is to go when it’s not so crowded, during the early morning or on weekdays. 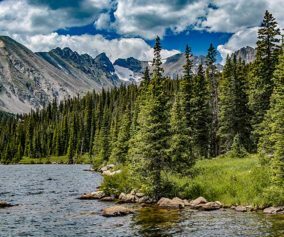 Scroll down to get all the details you need for this hike in Boulder, Colorado: trail map link, driving directions, weather forecast, and more tips. 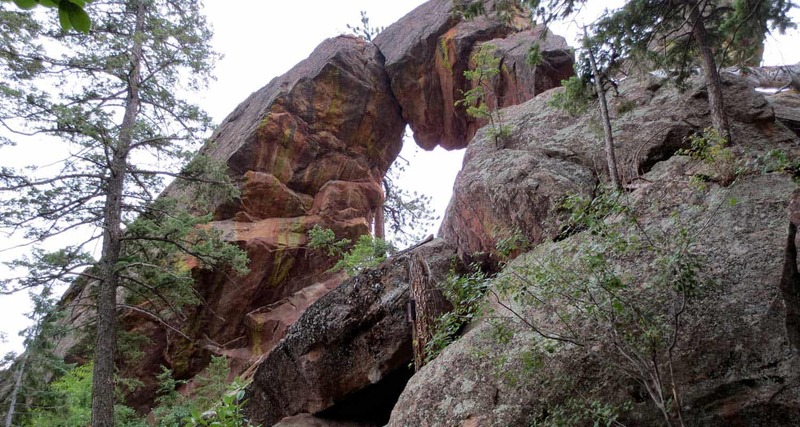 If you talk with someone who has hiked the trail up to Boulder’s Royal Arch, they will tell you two things: 1) The Royal Arch, though not as grand as some of the arches in Utah’s backcountry, is really a beautiful sight, and 2) That the hike is a real challenge. While the trail is relatively short – 3.5 miles round trip – the hike up through Bluebell Canyon to Royal Arch has a lot of uphill and downhill, making the elevation gain around 1400′ over the course of the trip. Because the trail has a lot of rock steps and is heavily used, the latter half of the hike requires some negotiation. It’s still a good trail, just don’t expect a walk in the park. Beginning at the Chautauqua Park Trailhead, take the Bluebell Road Trail through the meadows and up to the Bluebell Shelter (see trail map here). You’ll come to a junction near the Bluebell Shelter, and will see signs pointing you to the Royal Arch Trail. Soon, you’ll enter Bluebell Canyon. The Royal Arch trail will descend before beginning its climb to the top. This section of the hike is especially alive and enchanting during the early morning hours. Bluebell Canyon is home to raptors and is seasonally protected when the birds are hatching. The trail is still accessible during those times, but signs are posted to keep the canyon drainage clear of hikers. The higher you hike, the more stairs you’ll encounter. It’s nothing like hiking the Incline in Colorado Springs, but it’s still a real workout. If you hike to the Royal Arch on the weekend, this is where you’ll begin to experience the trail congestion. 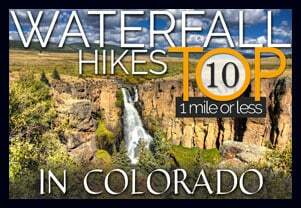 In fact, I’d have to say that this was the most overcrowded trail I’ve hiked in Colorado. A lot of hikers had stopped to rest, huffing and puffing trailside. Others gathered right in the middle of the trail. I overheard several people deliberating whether or not to keep going, and watched others turn around without making it to the top. So, our first and most important tip would be to hike to Royal Arch early in the morning by getting on the trail before 8AM, or hiking the Royal Arch trail on a weekday. 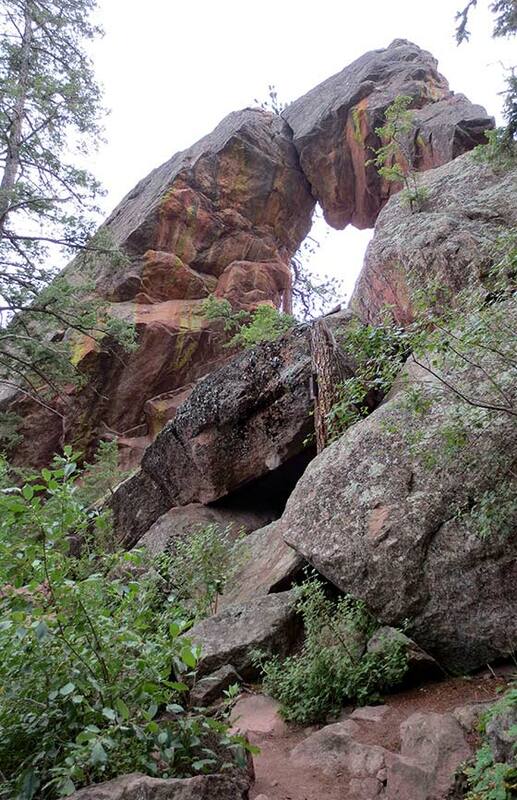 After pushing up to Royal Arch, be sure to walk around it and go through it. 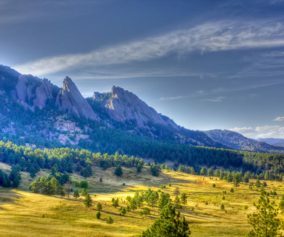 The views of Boulder are incredible. On a clear day, you can see all the way to Denver. I’d recommend taking a picnic or at least a snack, and kick back for a while. There is supposedly a way to make this hike more of a loop by taking a trail down the backside of the arch, but it’s an unmarked trail and one hiker who took it warned against it. So, we recommend taking the marked Royal Arch trail back down to the shelter. From there, you have some trail options. 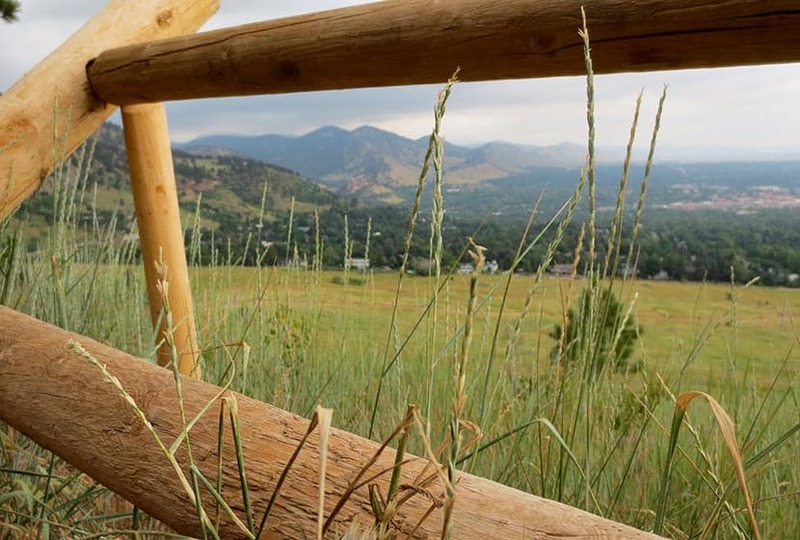 On my way back, I decided to take the Bluebell Mesa trail down to the Chautauqua trail, which led me home to the trailhead and ranger cottage. I’d highly recommend this route back. 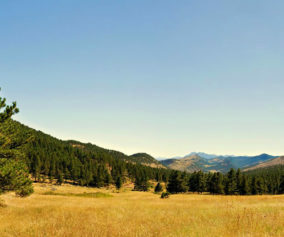 It takes you through a stand of pines on a mesa above the meadows of Chautauqua Park. You can pick up the Bluebell Mesa trail near the Bluebell Shelter soon after you exit the canyon. Leave Fido At Home: I love dogs; in fact, I took our Dog, Francine, on the hike up to Royal Arch. But it was so congested that it made it difficult for her and I to navigate the trail together. Other dog owners with long leashes nearly tripped several hikers along the trail. If you want to bring your dog on this hike, I’d recommend going early or going on a weekday. Bring Snacks and Water: It probably goes without saying, but be sure to bring food and water to refill your tank. This hike demands it. Bring Trekking Poles: The trail up to Royal Arch can be hard on the knees–especially the descent–so bring trekking poles if you have them. The trail is heavily shaded, so my guess is that it will ice up in the winter. Just another reason to bring something that will help you get traction. Take Time at the Top: Build time into your hike to rest and maybe have a picnic under the Royal Arch. 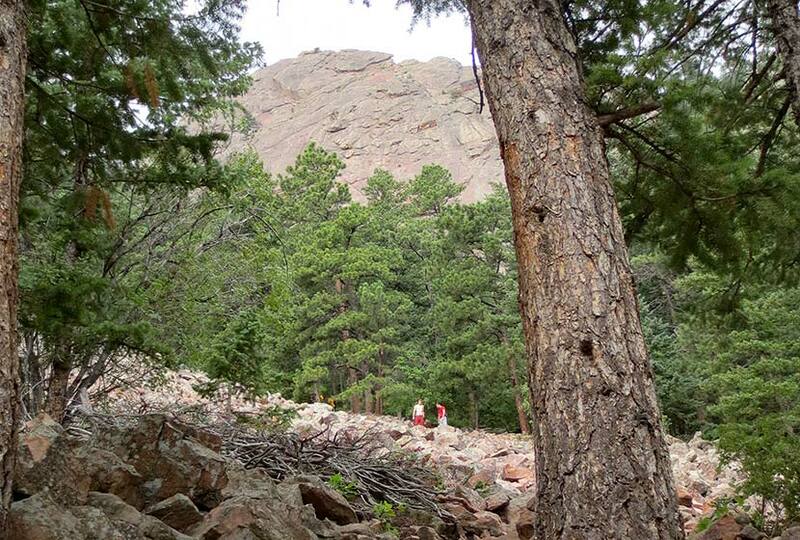 Keep and Eye on the Weather: Talking to one of the rangers, he shared that storms can come up quickly along the Flatirons, which will catch hikers unawares. Because you are hiking through a densely wooded canyon and are so close to the mountain, it makes it difficult to really judge the skies. 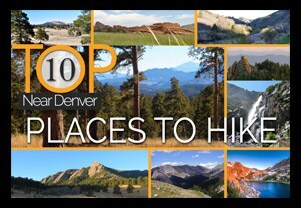 But the Flatirons area is like a lot of other mountain hikes, storms typically roll in during the early afternoon. I’m wondering if there are any bus systems from Denver to this place? I did this hike last week. Beautiful!!! To get there from Denver take the FF1 (Flatiron Flyer) to the last stop (downtown Boulder) and then I called a Lyft to get to the park. It was about $9 but I didn’t want to waste my energy walking to the trail. 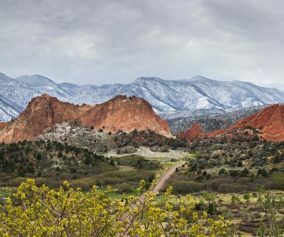 FYI – the FF1 lets you out blocks from Pearl Street, the Farmers Market, and some nice restaurants if you’re looking to explore some more before heading back to Denver. There is currently construction on Baseline right outside the Chatauqua Park parking area, making it a big pain to get in and out. Not sure how long this road work will last. I went today (a Wednesday) to hit it on a weekday per your suggestion, but it was sooooo crowded! So many off leash dogs creating a bit of a hazard on some of the more “technical” sections of the trail. And, (no judgment!) a ton of pot smokers stinking up the trail. Enough of my complaints, though–this hike is gorgeous. Very difficult and an assault on the knees, but take it easy with extra breaks to take in the beauty. It’s a crowded party at the top, but everyone was nice and made room for me on the rocks to take in the view and get some pictures. I was just in Moab a couple of weeks ago, and I would say this arch still stands up as a decent “worth it” hiking destination–it has a very “Colorado” sense to it that the big ole red rock desert arches don’t have. Very unique, and a fantastic sense of accomplishment afterwards! Is it doable with kids? We have 1 & 3 year old. How far is the hike to get to the arch itself? Thanks. It’s 1.7 miles one-way. When hiking with small children there are a lot of factors. The trail is high traffic and there are a good bit of wet, slippery surfaces, so I wouldn’t recommend this hike with small kids. When I went, there were also way too many dogs on the trail, which can be an issue with kids, too. 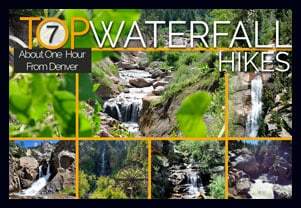 Check out our set of hikes with kids near Denver for more ideas. This may be 3.5 miles from the actual trailhead, but from the parking lot it was 4.6. July 3rd was probably as crowded as your average weekend, soooo many people. Agree with other posters, bring more water than you think you need. It was pretty at the arch, but so many people, even nice ones, made for a congested, not very serene destination. My daughter attends CU and took this hike a couple of weeks ago. While she was getting moved on to her new house she suggested I take the hike. It was not a walk in the park as mentioned but so well worth it. I went on a Friday. It wasn’t crowded at all. In fact I thought I took a wrong turn at one point because I was the only person on the trail. Views are amazing and yes … quite a sense of accomplishment for this 72 year old Mom ! !